Deep-sea creatures have always been a fascinating topic. Perhaps it’s the fact that you have to plunge deep into the unknown to see them. Or perhaps it’s because they live in such fascinating environments. Or maybe it’s the fact that they pretty much look like real-life Pokemon. Well, whatever the case, there’s no doubt that sea life gets pretty interesting a few thousand feet underwater. 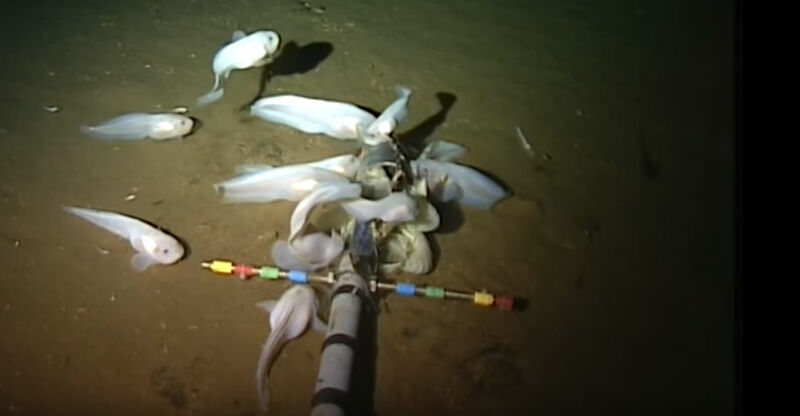 And this can be seen with the Mariana snailfish, the recently discovered species of ocean creature that has been named the deepest-dwelling fish yet. And, while it may seem decently adorable at first glance, this is a surprisingly tough fish you may want to stay away from. Living over 26,000 feet below the sea level of us civilized air-breathers, the Mariana snailfish lives in an environment with more pressure than an honors calculus course. In fact, the deep-sea creature lives in an environment with pressure that has described as “an elephant standing on your thumb.” Or, to put it in terms we can all understand, getting slapped by Jane Fonda. While the pink little fish may seem fairly harmless upon first glance, there’s much more than meets the eye. The snailfish, which has sharp teeth and transparent skin, feast upon deep sea invertebrates, using their ability to live in the high pressure environment as an advantage due to the lack of other predators. And, just like that, this fish goes from being a cute deep-sea creature to yet another frightening bottom dweller like the rest. As University of Washington postdoctoral researcher Mackenzie Gerringer said about the Mariana snailfish, “This is the deepest fish that’s been collected from the ocean floor, and we’re very excited to have an official name.” I’m going to assume that Mariana snailfish wasn’t their first name choice though, as “the nightmare fuel flounder” or “stay far away from me sturgeon” seem to fit much better. In addition to the Mariana Trench, the creature is also located off the coast of San Juan Island, so you know exactly where not to go for your next vacation. In fact, between the discovery of this creature and the recent footage of a shrimp literally ripping a fish’s stomach open to retrieve another fish, you should probably just stay away from the ocean altogether.